This luscious fig jam is delicious when served with plain and simple bread and butter or toast, but it's also delicious with cheese and crackers. Fresh figs are sweetened with caster sugar, flavoured with lemon juice and simmered to perfection. Wash and dice the figs. Place into a large pot with the sugar and lemon juice and leave to marinate overnight. The following day, place the pot onto the heat and bring to the boil before reducing to a simmer. Simmer for 40 minutes. Spoon the jam into sterilised jars and place into a cool dark place. You can jazz up this jam depending on what you want to serve it with - for example, if you want to make it more of a savoury jam, add 1 tbsp. of dried chilli and a pinch of dried herbs. If you want to make it into more of a dessert jam, add the seeds of one vanilla pod. This recipe makes around 60 portions. We are blessed to have a very old tree that produces loads of big juicy black figs every August. So I am always looking for recipes. I made this jam yesterday. I reduced the sugar because our figs are very sweet, and quartered the fruits to keep them chunky. Result was delicious, but a bit more runny than other fruit jams, even though I simmered it for about 2 hours. It would be delicious drizzled over pancakes, or with yoghurt or ice cream. A taste of summer preserved for winter! Summary: This luscious fig jam is delicious when served with plain and simple bread and butter or toast, but it's also delicious with cheese and crackers. 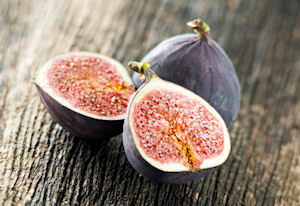 Fresh figs are sweetened with caster sugar, flavoured with lemon juice and simmered to perfection.